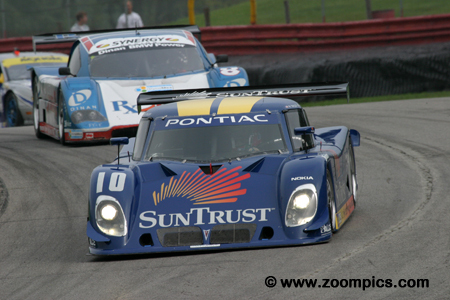 The 2005 Grand American Road Racing Championship (Grand Am) was the sixth season of the series. A business model which controlled costs, had stable rules and avoided being on dependent of automotive manufacturers attracted many private teams. Based on the failure, of its predecessor, the United States Road Racing Championship in 1999 critics suggested that the Grand Am would suffer a similar fate. This was proving not to be the case as entries were continuing to grow. Grand Touring (GT): In 2004, there were two production-based classes: Grand Touring and Super Grand Sport which initially competed in the Grand Am Cup division. These two categories were combined into a single class in 2005. Participating in this group were manufacturers such as Porsche, BMW, Chevrolet, Mazda, Ferrari and Pontiac. As with the Daytona Prototypes, engine displacement was used to establish the weight of different makes and models. One of the top stories in 2005 was that Hoosier Racing Tire became the exclusive tire supplier for the series. Also making news was the addition of two new race tracks on the schedule. 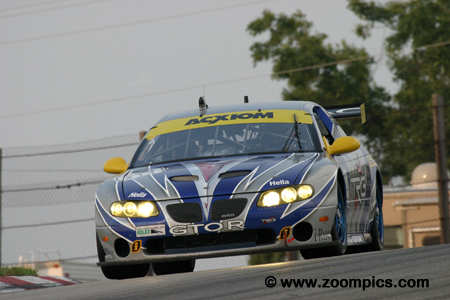 For the first time, the Grand Am series would compete at Mazda Raceway Laguna Seca and Autodromo Hermanos Rodriguez. As in the past, the season opened in February with the Rolex 24 at Daytona International Speedway and ended in Mexico at Autodromo Hermanos Rodriguez. In between these two venues, there were events at Homestead-Miami, California Speedway, Mazda Raceway Laguna Seca, Mont-Tremblant, Watkins Glen, Barber Motorsports Park, Mid-Ohio, Phoenix International Raceway and Virginia International Raceway. There was a total of fourteen events with the series competing at Daytona twice and Watkins Glen three times. 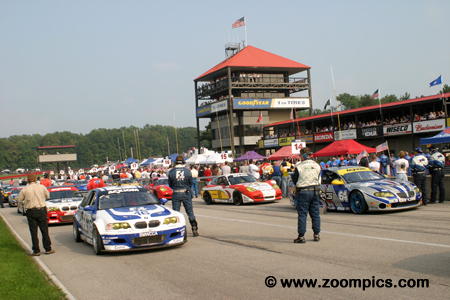 Mid-Ohio was race ten of the fifteen rounds contested during the 2005 Grand-Am season. Forty-four entries started the ninety-four lap race around the 2.258-mile thirteen-turn road course. 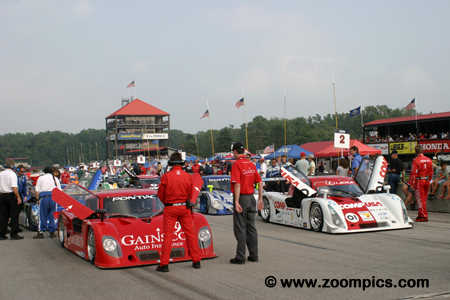 It is late Saturday afternoon and a total of forty-four entries line-up on Mid-Ohio’s front straight for the Emco Gears Classic. On the pole is the No. 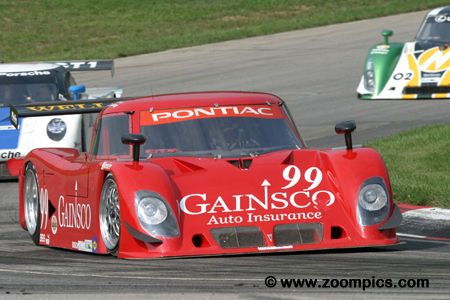 99 Gainsco Riley driven by Alex Gurney and Bob Stallings. Next to them is Ganassi Racing entry shared by Luis Diaz and Scott Pruett. A total of twenty-one Daytona Prototypes would take the Starter’s green flag. At the end of qualifying, Alex Gurney was the quickest, piloting the No. 99 Riley MK XI entered by Gainsco/Blackhawk Racing. Sharing the driving duties with Gurney was the team owner, Bob Stallings. Gurney led the first thirty-six laps and at the first pit-stop they made a driver change. Stallings was in contention until the car developed power steering problems. They finished in eleventh place. In qualifying the fastest Crawford was the Howard-Boss Motorsports entry shared by Butch Leitzinger and Elliott Forbes-Robinson – they were gridded sixth for the start. During the event, the pair raced with the lead group. 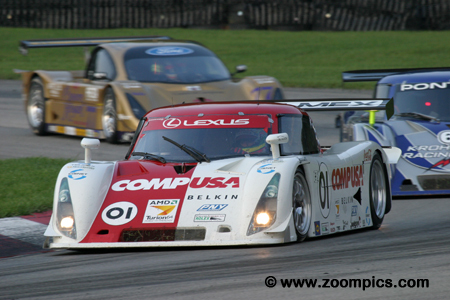 Leitzinger found himself in second place after the final restart but three laps later he passed race leader Scott Pruett. He was able to fend off Pruett’s challenges and won by 0.465-seconds. At the end of the 15-minute qualifying session, Jorg Bergmeister was fourth quickest. Bergmeister shared the No. 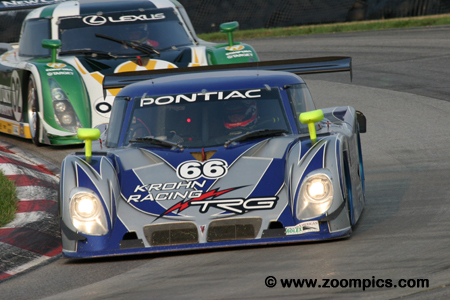 66 The Racer’s Group/Krohn Racing Riley with last year’s Daytona Prototype co-champion Max Papis. Early in the race, Bergmeister and Papis looked like a threat to win but their progress was hindered when the ice box for the cool suit came loose. 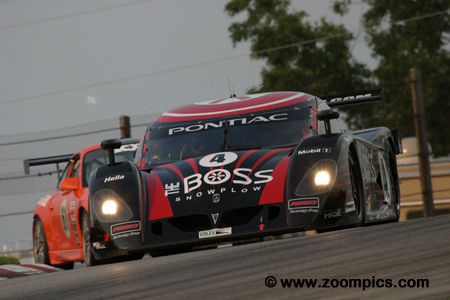 They finished fifth place in the Daytona Prototype class. Kelly Collins was fourth quickest in the Grand Touring category but the Prototype Technology Group BMW M3 was required to start from the rear of the field after a technical infraction was identified. 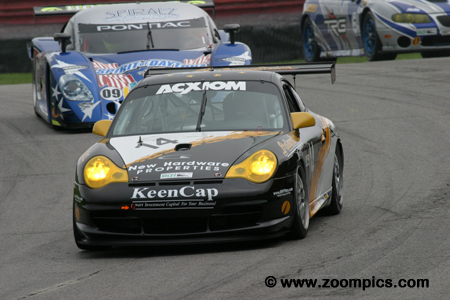 By the end of the contest, Collins and his co-driver Tommy Milner were in contention for the GT win. A late race pass by Milner on race leader Andy Lally allowed the pair to capture the class victory. This was Collins first win of the season and the second for Milner. 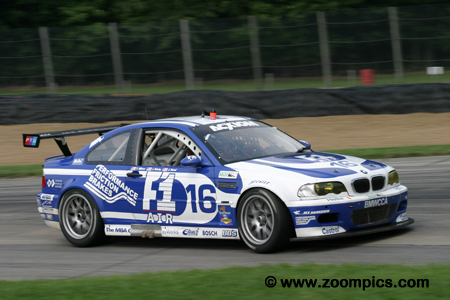 Quickest of the Grand Touring competitors was Justin Marks in the Prototype Technology Group BMW M3. Co-driving the BMW with Marks was Joey Hand. As driver partners, Marks and Hand had won the Grand Touring category in last three rounds. 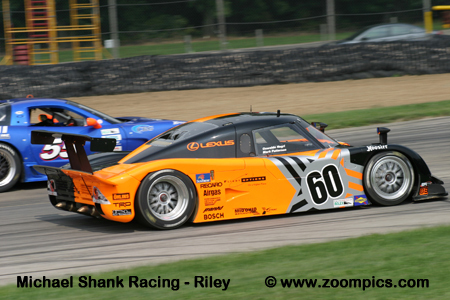 This was not to be the case at Mid-Ohio - the pair finished thirty-fourth overall and sixteenth in class. Making a guest appearance in the No. 64 Pontiac GTO.R was factory Corvette driver, Ron Fellows. Fellows qualified The Racer’s Group Pontiac beside pole-sitter, Justin Marks. Sharing the GTO with Fellows was Paul Edwards. Fellows and Edwards would lead the Grand Touring category but after eighty laps they retired with a left-front suspension failure. Lining up behind the Daytona Prototypes were twenty-three Grand Touring cars. Leading the way would be Justin Marks in the No. 16 Prototype Technology Group BMW. Beside the BMW was Ron Fellows filling the seat in the No. 64 Pontiac GTO.R, normally occupied by Jan Magnussen. Luis Diaz was responsible for the qualifying the No. 01 Chip Ganassi Racing Riley MK XI. Diaz succeeded in starting next to the pole-winning Riley. He shared the Ganassi Riley with 2004 Daytona Prototype co-champion Scott Pruett. As the contest neared its end, it appeared that Pruett and Diaz would win their third race of the season. But three laps after the final restart Pruett was passed by Butch Leitzinger. He and Diaz finished second. Disaster struck the SunTrust Racing team during qualifying. Wayne Taylor was behind the wheel when the car burst into flames on Mid-Ohio’s back straight. Taylor was not hurt but there was extensive fire damage to roof and rear of the car. The car was repaired overnight and the pair would start nineteenth as the result of an engine change. The two drivers fought their way through the field and finished third. Long time series competitors – Greg Wilkins and David Lacey shared the No. 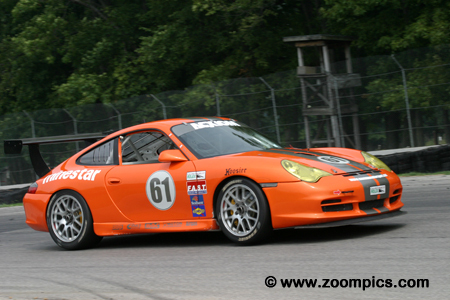 61 SAMAX/Doncaster Racing Porsche GT3 Cup. The pair were gridded thirty-sixth overall and fifteenth in the Grand Touring category. Wilkins and Lacey improved on their starting position throughout the event and were third in the Grand Touring class at the checkered flag. 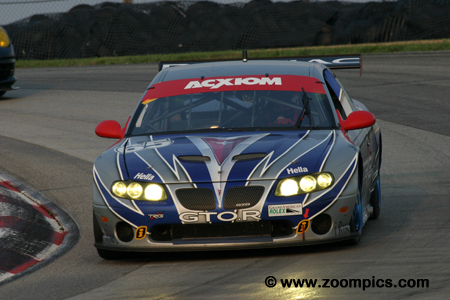 The second of The Racer’s Group Pontiac GTO.Rs was piloted by 2004 Super Grand Sport co-champions Marc Bunting and Andy Lally. The No. 65 Pontiac would start eighth in the Grand Touring class and twenty-ninth overall. The two drivers made their way to the front of the category. Lally was leading Grand Touring when he was passed by Tommy Milner in the No. 21 BMW M3. Lally and Bunting would finish second in class. Gridded thirty-first overall and tenth in the GT class was the Autometrics Motorsports Porsche GT3 Cup of Leh Keen and Cory Friedman. In June at Watkins Glen, Keen and Friedman teamed up with Wolf Henzler to grab the class victory in the Sahlen’s 6-Hour race. At Mid-Ohio, they would be twenty-first overall and fourth in class at the checkered flag.